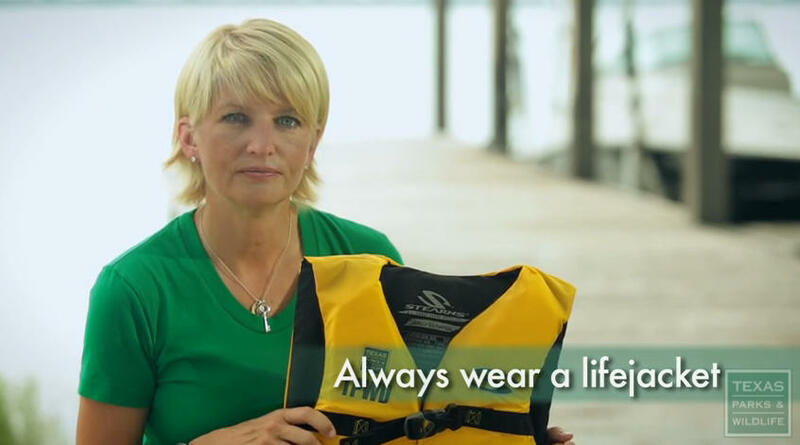 Still from Beautiful But Gone video: Dana Gage, whose son died from a diving accident, urges viewers to wear a lifejacket. Tim Spice, Boater Education Manager with Texas Parks and Wildlife, said the department last month introduced a new video titled, "Beautiful But Gone" to reach young people who participate in water sports and to warn them of the tragedies that some think will never happen to them. "The coast guard says that 90% of the people who drowned in a boating-related accident would be alive if they just had a life jacket on. That's significant," Spice said. Dana Gage, who spoke on the video about losing her son Connor, said it’s not all about boating accidents. "Connor did a flip off the top of this boat dock, and he landed badly," Gage said. "And he did not resurface." Parks and wildlife spokeswoman Stephanie Salinas said the video campaign targets young people with information they can use to help each other as well as themselves. "A lot of the things people don't realize about drowning is that if you're drowning, you don't flail and make a lot of noise like a lot of people think you do. Sometimes it can be completely silent and someone can drown without you even knowing it," she said. Both of the videos, "Beautiful But Gone" and "Never Happens" are available on YouTube. Spice said the Texas Education Agency has agreed to include “Never Happens” in the state’s driver education program to help educate teenagers about safety practices not only when they’re on the roads, but also when they’re on Texas lakes, rivers, and the bays and Gulf of Mexico. "It's a great opportunity. I can't reach the number of teenagers that we're going to reach through driver's ed. That's 225,000 fifteen and sixteen year olds," Spice said.